The Philadelphia Union play in a stadium in Chester, Pennsylvania. It’s on the Delaware River waterfront near a casino and a prison. Despite the odd location, the stadium—built with $77 million in public money—is pretty nice. It’s still relatively new. The riverfront location and the Commodore Barry Bridge in the background provides a unique venue for a game. So unique, in fact, that the stadium is in demand. The Union also rent out the stadium to high schools for big games. And this has upset the players quite a bit. 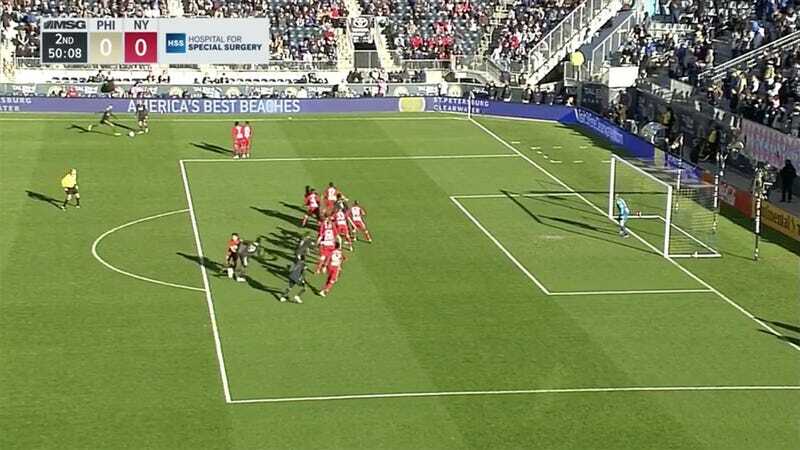 Yesterday the Union lost 1-0 to the New York Red Bulls on a second-half penalty by Kaku. But after the game the players weren’t so angry at themselves for the loss. They were angry at the condition of the field. Of course, the Union are fighting for a home playoff game while midfielder Haris Medunjanin tells reporters he’d rather play away. Despite yesterday’s loss, if the Union beat NYCFC next Sunday the team will get the Eastern Conference’s third seed in the MLS Cup Playoffs and will host a playoff game. Good luck, maybe! Despite the loss and the field conditions, though, things weren’t all bad for Union fans yesterday. The Union are now renting that car out to local high school students for their driving tests.